This article by Thora Tenbrink, Reader in Cognitive Linguistics, at the School of Linguistics & English Language was originally published on The Conversation. Read the original article. How often have you thought that somebody talks just like an accountant, or a lawyer, or a teacher? In the case of artists, this goes a long way back. Artists have long been seen as unusual – Frank Lloyd Wright’s Fallingwater in Mill Run, Pennsylvania. : Iam architect via Wikipedia Commons, CC BY-SApeople with a different way of perceiving reality. Famously, the French architect Le Corbusier argued in 1946 that painters, sculptors and architects are equipped with a “feeling of space” in a very fundamental sense. Artists have to think about reality in different ways to other people every day in their jobs. Painters have to create an imaginary 3D image on a 2D plane, performing a certain magic. Sculptors turn a block of marble into something almost living. Architects can design buildings that would seem impossible. Think of Edgar Mueller’s famous street art. Or Michaelangelo’s Pietà. 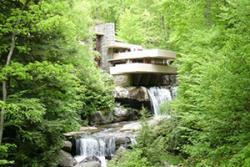 Or Frank Lloyd Wright’s Fallingwater, which seems to defy physics. All of these people are (or were) experts in rearranging the spatial relationships in their environment, each in their own way. This is a necessary skill for anyone who takes up these crafts as a profession. How could this not affect the ways in which they think – and talk – about space? Our recent study, a collaboration of UCL and Bangor University, set out to test this. Do architects, painters, and sculptors conceive of spaces in different ways from other people and from each other? The answer is: yes, they do – in a range of quite subtle ways. Painters, sculptors, architects (all “spatial” professionals with at least eight years of experience) and a group of people in unrelated (“non-spatial”) professions took part in the study. There were 16 people in each professional group, with similar age range and equal gender distribution. They were shown a Google Street view image, a painting of St Peter’s Basilica in the Vatican and a computer-generated surreal scene. For each picture, they were given a few tasks that made them think about the spatial scene in certain ways: they were asked to describe the environment, explain how they would explore the space shown and suggest changes to it in the image. This picture-based task was chosen because of its simplicity – it doesn’t take an expert to describe a picture or to imagine exploring or changing it. From the answers, we categorised elements of the responses for both qualitative and quantitative analyses using a new technique called Cognitive Discourse Analysis with the aim of highlighting aspects of thought that underlie linguistic choices beyond what speakers are consciously aware of. We made a short film about the research which you can watch below. 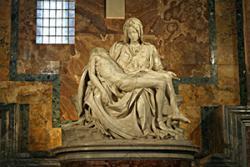 Michelangelo’s Pietà in St Peter’s Basilica in the Vatican. : Stanislav Traykov via WIkimedia CommonsOur analysis led to the identification of consistent patterns in the language used for talking about the pictures that were revealing. Painters, sculptors and architects all gave more elaborate, detailed descriptions than the others. Painters were more likely to describe the depicted space as a 2D image and said things like: “It’s obvious the image wants you to follow the boat off onto the horizon.” They tended to shift between describing the scene as a 3D space or as a 2D image. By contrast, architects were more likely to describe barriers and boundaries of the space – as in: “There are voids within walls which become spaces in their own right.” Sculptors’ responses were between the two – they were somewhat like architects except for one measure: with respect to the bounded descriptions of space, they appeared more like painters. Painters and architects also differed in how they described the furthest point of the space, as painters called it the “back” and architects called it the “end”. The “non-spatial” group rarely used either one of these terms – instead they referred to the same location by using other common spatial terms such as “centre” or “bottom” or “there”. All of this had nothing to do with expert language or register – obviously people can talk in detail about their profession. But our study reflected the way they think about spatial relationships in a task that did not require their expertise. The “non-spatial” group did not experience any problems with the task – but their language seemed less systematic and less rich than that of the three spatial professional groups. Our career may well change the way we think, in somewhat unexpected ways. In the late 1930s, American linguist Benjamin Lee Whorf suggested that the language we speak affects the way we think – and this triggered extensive research into how culture changes cognition. Our study goes a step further – it shows that even within the same culture, people of different professions differ in how they appreciate the world. The findings also raise the possibility that people who are already inclined to see the world as a 2D image, or who focus on the borders of a space, may be more inclined to pursue painting or architecture. This also makes sense – perhaps we develop our thinking in a particular way, for whatever reasons, and this paves our way towards a particular profession. Perhaps architects, painters and sculptors already talked in their own fashion about spatial relationships, before they starting their careers. This remains to be looked at in detail. But it’s clear from our study that artists and architects have a heightened awareness of their surroundings which is reflected in the way they talk about spatial environments. So next time you are at dinner with an architect, painter, or sculptor, show them a photograph of a landscape and get them to describe it – and see if you can spot the telltale signs of their profession slipping out.